I spent last week visiting UCA Miraflor, the co-operative that grows all of Twin Cafe’s coffee. The co-operative is based in Miraflor which is a protected nature reserve in northern Nicaragua. 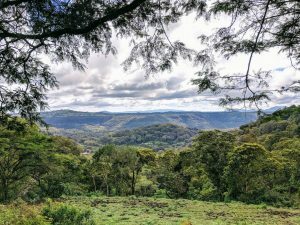 It’s located 30 km outside of Estelí, Sheffield’s twin city. The nature reserve is famous for its bio-diversity, with more than 200 identified species of orchid and over 236 species of birds. Before the revolution, the land in Miraflor was owned by just 5 families. When the Sandinistas won in 1979 they bought the land from these families and redistributed it to smallholders many of whom formed themselves into co-operatives that are now part of UCA Miraflor. I went to Miraflor with my girlfriend Beth and two friends, Reem and Becky. We’re all English but Becky’s Mum is Nicaraguan and she grew up moving between Nicaragua and the UK. This meant she could provide much needed Spanish assistance! Travelling to Miraflor isn’t easy. Unless you’ve got your own 4×4, the only way to get to Miraflor is by bus. These huge retired school buses have been bought from the states and are known as chicken buses. Each one is an independent business and has been personalised by their owners. Most have strapped in a wide screen tv up front and blare out a sound track based on the eccentricities of their owners’ music taste. You’ll hear everything from gangster rap to merengue. The buses form a key part of the local infrastructure. As they travel along their routes they not only pick up people, but crops and livestock from farms that they pass by, then drop these goods off further along their route. You’re just as likely to see a pig in a bag being hauled on to the roof of the bus as sacks of maize, potatoes or coffee. We were lucky enough to claim four seats before the bus filled to bursting point. Having visited Miraflor four years before, I was struck by how little had changed. I’m pretty sure I recognised the bus driver and a bunch of the people onboard. The bus quickly left paved roads to trundle along a rocky track, crossing a river a metre deep, and slowly (really slowly) taking us up to around 1,500 metres above sea level. At this altitude Miraflor feels completely different to the other parts of Nicaragua. It was much more like being back in the UK; it rains more often than not and lush green foliage covers everything. When it’s cloudy, thick mist descends and you can only see about ten metres in front of your face. The bus finished it’s journey and dropped us off in front of a beautiful lodge where the co-operative had been kind enough to put us up for the week. The next morning Wester came to meet us. He was our guide while we were in Miraflor, helping us to learn about the community and the co-operative. He’s 23 years old and lives on his grandad’s farm where he began to help out from around the age of 11. 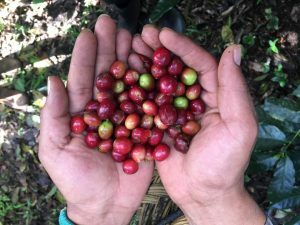 His family are the main growers of coffee in the La Cebolla community, and if you’ve drunk Twin Cafe coffee before then you’ll probably have tasted some of the coffee that his family have produced. As Wester walked with us through Miraflor he explained some of the challenges that the community faces. He told us that many of the farmers prefer to farm organically as they understand that pesticides can be harmful to the health of the farmers and their families, as well as being damaging to the environment, but financial pressures often mean that farmers view going organic as too great a risk. He explained that for a crop like potatoes farmers need around $4,000 to cultivate an acre of land, and to cover this cost some farmers need to borrow money from a bank. If their crop then fails, for whatever reason, the farmers are left with debt. If they borrowed money from a bank and are unable to repay the loan, the bank may repossess their farm. This means that if farmers feel that pesticides will increase the chance of a good harvest then they will use them despite the risks to their health or the damage to the environment. All of UCA Miraflor’s coffee farms are organic and shade grown. Twin Cafe and other purchasers pay a premium for this. Wester talked us through the importance of growing coffee with the right mixture of plants and trees around them. This is good for the coffee, and great for the animals and birds that depend on a diverse eco-system. In other parts of Miraflor where only one crop is grown the soil is eventually damaged making it harder for future generations. The deforestation caused by this type of farming also reduces the diversity of wildlife which makes Miraflor so unique. At the moment the coffee cherries on Wester’s farm are ripening and they’re beginning to pick them. Wester’s family do a lot of the work but are also helped by friends and other people in the community. They each carry a basket and move between the coffee plants picking only the ripe cherries so that the flavour of the coffee will be just right. All of the work is done by hand, in contrast to large coffee farms where they may use machinery to pick the coffee cherries or employ large groups of migrant workers who pick all of the cherries at once producing a lower quality product. In an average day the pickers will fill 8 to 10 baskets. Next the coffee is processed at the farm. The fruit and husks are removed, the beans are washed, dried, and then sent to Matagalpa, where they’re packaged and shipped off for your drinking pleasure. At each stage of the process any sub-standard coffee beans are removed to ensure the final product is the best possible quality. This ultimately enables the farmers to sell their coffee for a higher price. The coffee currently being harvested will reach Sheffield around September where it will be roasted and then sent out to you (as soon as you make an order!). To state the blindingly obvious (a favourite past time of mine) the people behind your morning cup of coffee are real, with families and communities that rely on coffee sales. We depend on them, and other communities like them, for so much of the food and drink that enriches our lives in the UK. Their fates are caught up in our choices as individual consumers and in the choices of companies like Twin Cafe. One thing that we hope to do is to bring you closer to them. Together we’ll explore the challenges, triumphs and sheer hard work they put in to producing amazing coffee. Keep your eyes peeled for future instalments over the next few weeks. I will talk you through some of the issues that are affecting Wester’s community and the impact that climate change is having on Miraflor. 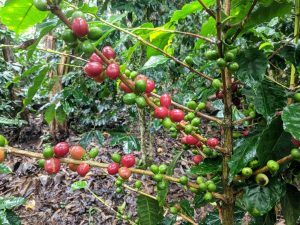 I will be spending a week working as a coffee picking labourer, learning just how tough it can be, and looking at how UCA Miraflor is working to improve the lives of people in their community. Very interesting Sam. Thank you for bringing us into their world!